Two of Melbourne's favourite duos come together for this very special, very limited vinyl release. On one side of the single, you'll find Shrimpwitch's shrimp-charged garage punk masterpiece, Digestion - the first taster of their wildly dramatic debut album (out January 2019). Digestion imparts the aspiring sequel, of sorts, to their 2017 hit Lust For A Kick. 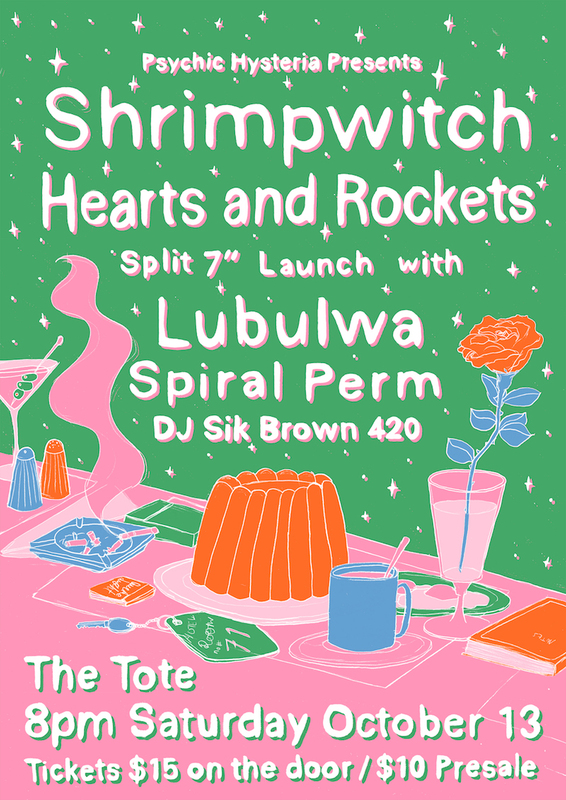 Shrimpwitch entered collective consciousness of Melbourne punters in 2015, playing countless shows and self-releasing a couple of absolute corkers - all the while challenging the notion of what a live show should be, including jokes and banter that put the best comedians to shame. Launching their debut 7" via the highly-lauded Hysterical Records last May to a sold out crowd secured their place as a favourite in Melbourne's long line of legendary garage punk acts. Their latest, Digestion, is to Australian music what the Gun Club was to the 80s punk scene. Coming up on the right side of rockabilly and surf, but with a definitive post-punk approach, the song rollicks through your lounge room and into your hearts. Hearts and Rockets have pushed themselves beyond the Heat Wave days, taking the fun and energy of their debut album Dead Beats and adding some serious pop smarts. Their second album is due in March 2019, and Dance Off is just a toe in the water of things to come. Their trademark buzzing bass drives this one again, while Kalindy gives the blokes in the front row a definitive no. Their classic synth sound is also here but with the new addition of Kalindy on guitar, Hearts and Rockets reinvent the very sound they created only 2 years ago. Out on 7" Saturday October 13, available on all digital and streaming platforms soon. For further info or to arrange an interview, please drop me a line via reply email or call 0423 382 203.